There's a good chance that Carolina Panthers superstar Cam Newton won't be so quick to forgive Buffalo Bills wideout and former teammate Kelvin Benjamin, who recently blasted him with unprovoked and harsh criticism. Before the two teams square off Thursday night in a preseason opener--THANK GOD--Cam called Benjamin over for some harsh words. Benjamin, who was traded to the Bills last season before the deadline, and to the disappointment of Cam, told the media that his fit in Carolina was not right and that he would have been better with pretty much any other quarterback under center than Newton. As if out of a script, the two teams meet today for Week 1 of preseason action leaving Benjamin and Newton on the same field to hash out their differences. 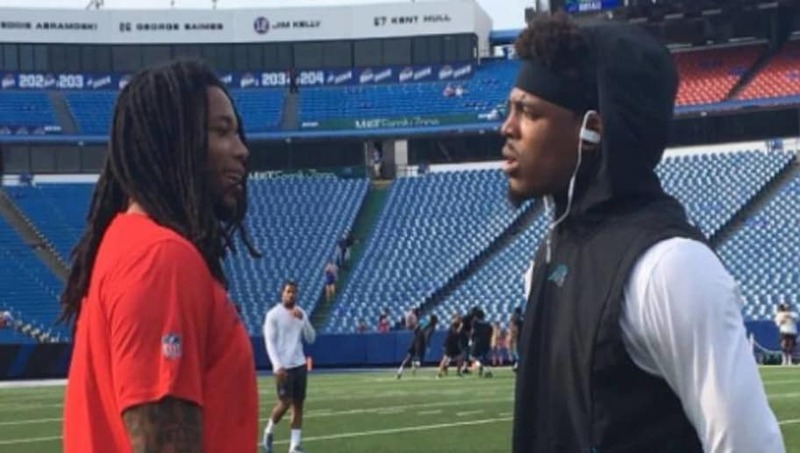 Cam Newton and Kelvin Benjamin finally met up to talk on the field. Through my binoculars I didn’t see any smiling, KB shrugged him off mid-sentence & starts to walk away, then Cam makes a “bye then” motion with his hand. Did not appear to go well. Can’t speak for what was said. Yikes, that doesn't look too promising for the former dynamic duo. If a picture could speak volumes, then the one below screams tension. Newton's face looks like that of a man who can't understand why a former "friend" stabbed him in the back, while Benjamin looks as if he's nervously trying to explain himself out of the awkward situation he unnecessarily put himself in. So where we gettin' dinner later, boys?